I play with alot of lip products all the time! I'm persistently and eternally searching for one that will stick around on my lips from the early morning hours when it's thrown on, until I arrive home after a long day of coffee drinking, careless noshing and whatever else may occur. I know I am not alone in this quest, a long lasting lipstick is a makeup wearers dream! When I come across a lip product that promises super staying power, my heart beats a little faster and my self control goes out the window, another lipstick goes in the cart. It's a true mission guys, not kidding! When I came across these Smashbox Lip Lacquers, I wondered if they would tick all of the boxes on my strict lippie criteria. Did they impress? Keep reading and find out! Pigmentation: The color payoff on these is ridiculous, with one swipe you get full on color! Formulation and Consistency: I find it varies between colors. Amongst the ones you see here, 2 out of 4 (Pink Social & Firecracker) were creamy and went on smoothly and beautifully. The other ones (Bordeaux & Ultraviolet) went a bit patchy on me and were a little more difficult to build up. Your best bet with these will be to test them in store and see which you like for this reason. Lasting Power: The longevity is there with these but once again I found it varies amongst the shades. The red shade and the coral pink one both stay put for 8 hours while the other two seem to feather off within 4-5 hours. They all do leave behind a stain though and wear super comfortably without going dry and flakey at all like some lipstains can. Finish: These go on really glossy and then as that wears off throughout the day, the color sets in as a stain but still doesn't end up looking matte or flat. Scent: The only thing that comes to mind is sweet candy when I think of how these smell. It's nothing overly offensive or strong but it's definitely there if you give it a sniff as your applying. Packaging: I'm often quite bored when it comes to the Smashbox packaging, but how cute is this? I love the geometric looking print as well as the black twist off lid with a clear tube so you can see exactly what you'll be getting color wise. The applicator is also fabulous, it's shaped like an 8 and although is quite a typical douffet material, it gets the job done easily. Variations: There are 20 shades available on the Smashbox website, all of which have really adorable clever names. Because I found that the formulation seems to vary amongst the different colors, I am very intrigued to see which others will be truly fabulous. Next on the list to try is Calypso, Keepsake and Knockout. Price: For a lipstick these are definitely up there in price at $24.00. The ones that last all day and go on beautifully are worth every penny in my opinion. 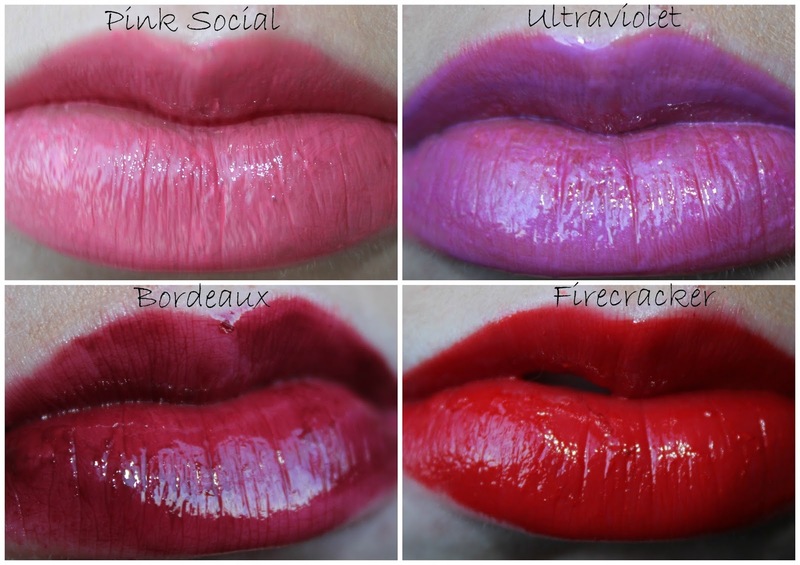 Overall: As you may be able to guess, Firecracker and Pink Social are my favorites. I have worn that pink shade almost every day since it arrived because it's so effortless, maintains itself and looks great with any makeup look! The other two left much to be desired to be honest, so I look forward to trying other shades from this line to see what they will be like. Have you given any of these lipsticks a try? If you have, what did you think of them? If you haven't do you want to?